Considering the huge financial investment we make in a home, we really should take into account more than the first-blush appearance of shiny floors, pretty fixtures and impressive color schemes. 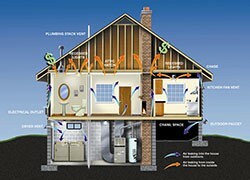 Taking stock of a home's inner parts & workings and optimizing the whole system can yield outstanding benefits. So in addition to the functionality and aesthetics, a TRULY beautiful home should provide a comfortable, healthy, and safe living environment while consuming minimal resources throughout its lifetime. A home's basic construction and its various systems (e.g. heating & cooling, ventilation, plumbing) are critical to this overall beauty of a home. Hmmmm... sounds like "green" and "sustainable", doesn't it? Traditional wood-frame homes are quite dysfunctional, leaving everyone vulnerable to uncomfortable - even unhealthy - indoor environments and certainly over-taxing financial resources during building operation. 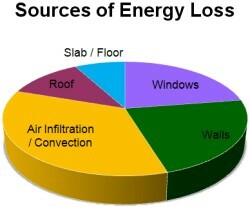 Operation and maintenance costs of traditional buildings often amount to 90% of overall building costs. Cold spots, drafts, rot, and mold & mildew are common problems inherent to traditional cavity construction. However, many builders still count on buyers knowing very little about the actual construction of the home and getting caught up in the skin deep "beauty". Factors such as utility costs, maintenance costs, and durability of the structure & its systems are rarely mentioned while much attention is given to upgraded cabinetry and luxurious looks. Basements are almost always shortchanged in the initial design, often being constructed without any insulation in the walls or under the slab. This shortcut on the front-end of construction significantly increases the cost of heating and cooling as the energy you paid for escapes to the surrounding soil. The International Energy Agency warned this week that governments aren't doing enough to prepare for the next spike in energy prices. Nobody really knows what energy costs will be in 10 years or 20 years. What would happen, if a barrel of oil costs $150, $250, or $350? Building highly efficient structures won't be just a good idea - it will be absolutely critical because monthly utility bills of a thousand dollars or more would certainly keep homeownership out of many people's reach. Fortunately, some governments start to realize that sustainable construction can bring enormous benefits so they are beginning to improve building codes. In the USA the American Clean Energy Leadership Act (ACELA) or "Bingaman bill" is currently before Congress and envisions building energy codes and standards to achieve a 50 percent improvement in energy efficiency of buildings by 2016. It also includes a residential high performance zero-net-energy buildings initiative. But why wait for better building codes when home buyers can insure themselves today against the many shortcomings of traditional construction? It is high time that home buyers demand a better product from the very start! Let's assume we have a clean slate and start the home building process at the beginning. Designers of highly efficient structures say "system engineering" is the key to reduce energy consumption; it means to design all the components of the building to work together smoothly. The building shell, the windows, the HVAC, and other systems are designed and constructed to optimize overall building performance. Most of a home's energy is spent on heating and cooling the interior, so minimizing heating and cooling requirements is the most important step in building energy-efficient structures. Orient and design it to reduce energy consumption: roof overhangs, window size and placement, and overall home shape have a big impact on managing heat gain and heat loss. See passive solar building design. Insulate and Seal the Building Envelope: It is achieved with high insulation, thermal mass, air tightness, and good windows and doors. The insulation should have high R-values and be continuous around the entire building (under-slab, walls, and roof) to minimize "thermal bridging". Thermal mass in building shells can act like a "battery for heat" - keeping the inside comfortable using almost no additional energy. Air tightness minimizes the energy leaking to the outside; ensure that the roof, and all windows and doors are tight and that the home meets strict air-leakage standards (measured in "blower door tests"). The kitchen, bedrooms and bathrooms need special attention to ensure they have adequate ventilation but still maintain energy efficiency. Thermal mass and air tightness also address the moisture condensation problems of wood-frame walls which cause rot, mold & mildew. ICF construction solves all of those requirements - why use anything else? Increase Heating and Cooling Efficiency: The heating and cooling systems need to be carefully matched to the high-efficiency building envelope. Standard-sized equipment will "short-cycle", turning on and off so frequently that it will negate any energy savings and wear out the units faster. Properly sized equipment will ensure maximum efficiency and the smaller equipment will cost less. In some climates a Heat Recovery Ventilator (HRV) or ground heat exchanger may make sense. Our system-engineered, Beautiful Home would require just 20 to 30 percent of the heating and cooling energy that a similarly sized, traditional wood-frame home needs. We can view that cost saving as an "energy annuity" that pays us back each and every month for the rest of our lives - even to future generations - and more so with rising energy prices! Our Beautiful ICF Home also provides much better comfort, health, and safety over traditional homes. Now we might even go ahead and put in the sparkly granite countertops and a home theater - we can truly afford those luxuries now! Now THAT is a Beautiful Home!